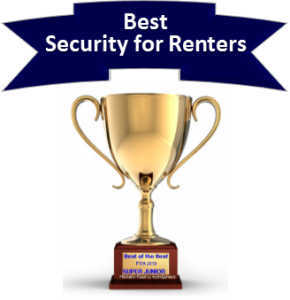 With the multitude of home security companies competing for your security dollars, it isn’t easy to select the best home security company to help protect your home and family. If you’ve narrowed it down to an ADT Authorized Premier Provider and Link Interactive Security, you are likely weighing the pros and cons of professional installation vs. DIY and the economics of these two worthy options. 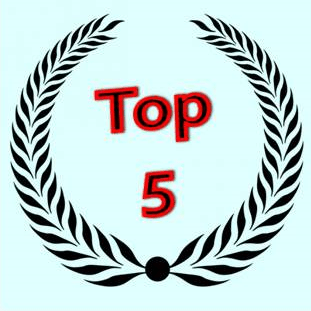 This 2015 comparative review will help you sort things out and determine which company best suits you and your unique security and home automation needs. 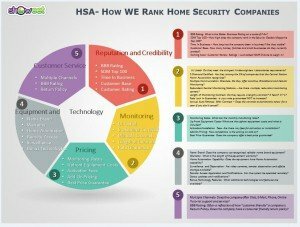 While many of the other “review” sites merely try to compare and contrast companies based solely on feature vs feature and dollars and cents….at The Home Security Advisor, we dig deeper and provide you with more of an in depth analysis, based on years of industry experience, that also includes some of the intangibles that help differentiate one company from another. This is particularly relevant in some comparisons, where you might be weighing the pros and cons of investing in an industry “giant”, utilizing more traditional equipment and installation methods….and relative newcomers leveraging newer self-installation technologies and equipment options. There are those that may contend that the numbers tell the story. But, sometimes, like in the “Rocky” series, it is the “intangibles” that determine the ultimate victor. Our ADT Monitored Security vs Link Interactive Security Review is the latest installment in our Home Security System Prizefight Series where our security company contenders will square off against each other in a side-by-side comparative review. This home security review will include 5 “Rounds” where each of the participants will be judged and ranked on a 5 star rating system for each individual criteria. The scores of each round will be calculated and averaged to decide the overall winner who will reign supreme until the next heavy weight security bout! So lets take a look and see how the home security heavyweights compare. Time to “weigh in” and see who can deliver the knockout punches? Protect Your Home, an ADT Authorized Premier Provider, was founded in 1988 and is the largest Authorized Premier Provider for ADT, the number one name in the home security industry. They have earned an A+ BBB rating by providing exceptional installation and service to thousands of satisfied customers. All monitoring services are provided by ADT , which was founded 140 years ago as American District Telegraph, ADT is the oldest and most recognized name in home security. Headquarted in Boca Raton, Florida, ADT is the largest security company in the country and clearly the most recognized name in the home security industry. They protect over 6 million homes and businesses and were originally founded as American District Telegraph 140 Years ago. While relatively new to the DIY home security business model, Link Interective is a subsidiary of Mountain Alarm-which has been protecting homes and providing exceptional customer service in Ogden, Utah for over 60 years. With an ADT monitored system from Protect Your Home, customers enjoy the best known brand name and strong name recognition associated with the largest security company in the US – which has held the top spot on the SDM Top 100 for over a decade. Link Interactive was introduced by Mountain Alarm to extend their reach nationally as a DIY option, and is now also available through the nation’s second largest retailer, Costco. Their support team has a 60 year track record of providing outstanding customer service- with a 98% customer approval rating and an A+ BBB rating. ADT operates 6 UL Listed, Five Diamond Certified monitoring stations across the country. This provides the highest level of redundancy- enabling calls to be rerouted in the event of a disaster in one area) Monitoring rates run from $36.99-$58.99. They both offer UL Listed, 5 Diamond Certified monitoring which provides 24/7 protection against intrusion, emergency and personal safety, fire and environmental hazards. Link Interactive monitoring offers fully integrated cellular monitoring, even on their basic monitoring package. This eliminates the possibility of defeating the system by disabling cable or landlines. Their basic monitoring package is truly an exception value, as it also includes 2 way voice authentication, Alarm.com interactive services, Geo Services and “Crash and Smash” technology which will notify the monitoring station even if the system is destroyed. Both companies offer quality monitoring services by highly regarded Central Stations. ADT Monitored Systems offers additional redundancy, but Link Interactive offers a host of additional services at extremely affordable rates- and is a clear winner in this category. Our ADT Authorized Premier Provider has been helping to protect homes and servicing their customers for a very, very long time. They have a solid A+ BBB rating, and install ADT Monitored systems which include the exclusive ADT 6 month service guarantee(restrictions apply). Although it should be noted, that this is not really a “no questions asked” return policy, it is a guarantee that any service oriented issue will be resolved within 6 months, or the system will be removed and your money refunded. With an A+ BBB rating, Link Interactive has a solid reputation derived from a 60 year track record of providing superior customer service. While there is no professional installation available, 92% of their customers found the system easy to install. Installation directions and videos are simple and straight- forward. In addition, unparalleled one-on-one support is available through multiple channels including toll-free telephone, e-mail and online chat. Although both companies offer quality customer service and an A+ BBB rating, the ADT Monitored System gets a slight edge in this department with their greater experience and 6 month service guarantee (certain restrictions apply). The equipment is professionally installed and varies depending on the package. ADT Monitored equipment is manufactured by industry leading vendors and private label branded to stringent standards. Package pricing and manufacturer may vary depending on location and package-but, typically the basic package pricing is competitively priced and carries the ADT 6 Month Service Guarantee (certain restrictions apply). One can select from a wide variety of security and home automation devices and services. However, while monitoring prices start as low as $36.99, the add ons and monthly monitoring prices can escalate very quickly as additional options are included. While most competitive entry level offers will include fairly basic equipment, Link Interactive inlcudes a premium touchscreen control panel in all packages – the highly regarded 2GIG Go! Control. This panel comes with an integrated Cellular Communicator and Z-Wave capabilities right out of the box. Their basic package includes a smoke/heat/freeze sensor and package configurations for advanced home automation are available for under $200…and only $29.99 a month! Although ADT Authorized Premier Provider – Protect Your Home offers professional installation, and most of the same overall capabilities of the basic Link Interactive packages…they are only available as a la carte upgrades and options-at substantially higher costs. The Link Interactive program offers a very simplified approach and includes the most popular and sought after technologies and equipment in one of two package offerings. 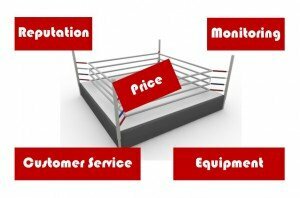 While ADT Authorized Premier Providers advertise reasonably competitive packages and rates, the costs may quickly escalate depending on your needs and interests. Basic packages are available starting at $99 for installation and as low as $36.99 for monitoring, but if you want interactive services (the ability to control your system remotely on the internet or a mobile device), cellular or home automation capabilities-both up front costs and monthly monitoring rates can quickly skyrocket. Typical monitoring packages run from $36-58. Professionally installed components are often 1.5x to 3X as expensive, making more comprehensive custom systems substantially more expensive. Link Interactive offers a Basic Fire and Security System for just $99….and an upgraded Energy Management and Security Home Automation starter package for just $100 more…both, with the same low $29.99 monitoring rate! 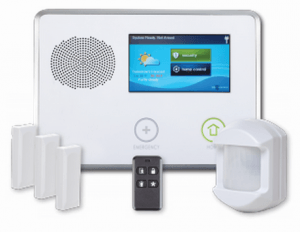 As a matter of fact, I was able to configure a sample custom package that includes a basic security system with 2GIG touchscreen control panel, PLUS…Fire and Life Safety, Home Automation and Video Monitoring for UNDER $300 and just $34.99/mo.! While the ADT Monitored Home Security System offers a decent entry level value and professional installation –Link Interactive wins this round decisively with more advanced features and services in the basic programs and substantially lower equipment and monthly monitoring rates! Both of these Heavyweight Prizefight Contenders are worth contenders for anyone looking to help protect their homes and families with a quality home security and automation system. Overall, an ADT Monitored System offers better name recognition, professional installation and a more storied history. 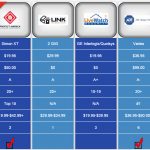 However, Link Interactive has been in the business of protecting homes for a long time, also…and enjoys an A+ BBB rating, while offering more advanced technology and superior monitoring features at substantially lower prices….in some cases almost half…that’s a lot to pay for a name brand! There may be some who still prefer the name recognition and are willing to pay substantially more for professional installation… but the value conscious consumer will find that Link Interactive is a Far Superior Value! Thank you for visiting. Please feel free to leave your comments and feedback on this ADT Monitored Security vs Link Interactive Review below.